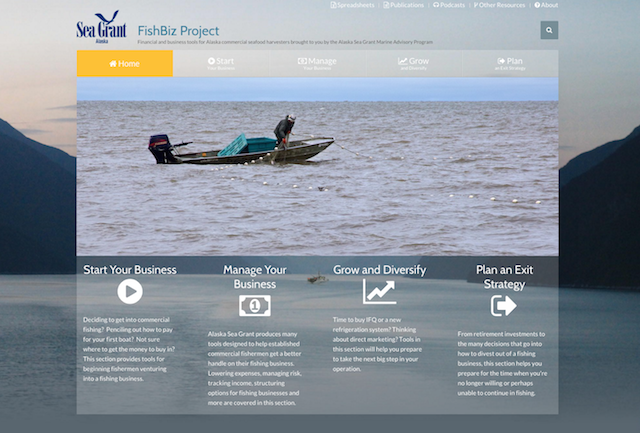 A screenshot of the revised alaskafishbiz.org site. The Alaska Sea Grant program announces new online business tools for Alaskan commercial fishermen. Via a website called Alaska Sea Grant FishBiz, commercial fishermen can find information on financing and other business management assistance. The website's resources are organized by fishing career phases. For those just starting out, they can find tools and resources about loans and paying for a first boat. For those fishermen ready for retirement, the website provides information on retirement investments and planning an exit strategy. While the website's been around for a while, the current version is much improved. A rural cooperative bank called CoBank funded the new version. The FishBiz website's address is www.alaskafishbiz.org.